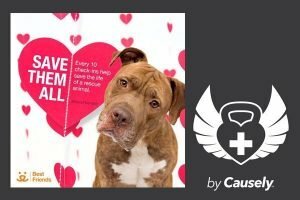 EarthFIT has teamed up with Sweat Angels by Causely, to make a donation to a different non-profit partner each month, simply by just using the monthly check in. This February we get to help our furry friends through the Best Friends Animal Society! Best Friends Animal Society has been running the nation’s largest no-kill sanctuary for companion animals and building effective programs that reduce the number of animals entering shelters. Every 10 check-ins will help save the life of a rescue animal #savethemall.